“The summer between the two year course at The Centre for Textile Conservation in Glasgow is an opportunity for students to explore the world of work under the supervision of professionals in the field. I was keen to return to May Berkouwer’s studio after a short placement the previous year, and assist in the conservation of a rather spectacular 1920s beaded dress. 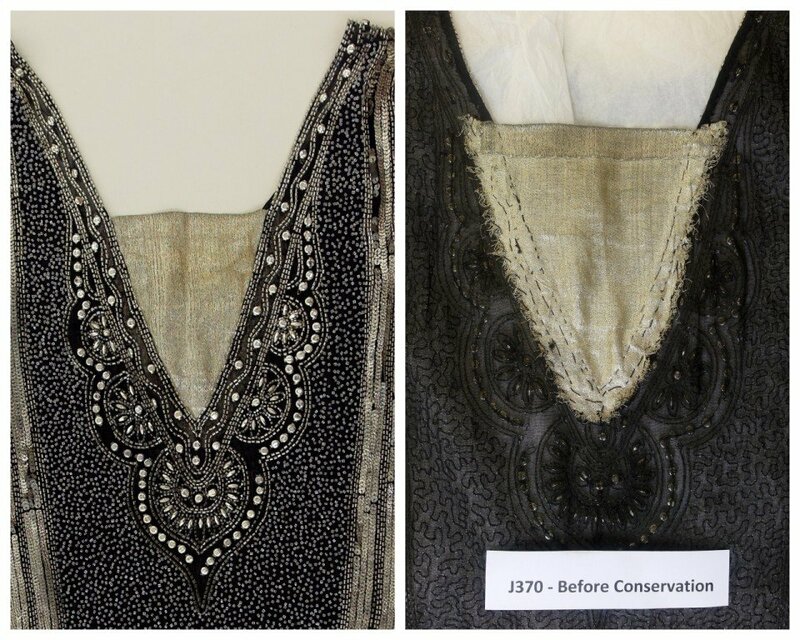 The dress had been undergoing documentation on my initial visit and belonged to a private client who wanted the garment stabilised for occasional wear and preserved as a family heirloom. Each object encountered during my summer at May’s studio has been quite an education with its own tale to tell, yet none more so than the beaded dress… Close inspection indicated an inset gold panel in the low V neckline was a later addition and its incompatibility with the rest of the garment justified its removal. After alteration we began to speculate as to whether the low V, without its inset panel, was more likely to have sat at the back and fallen between the shoulder blades than at the front of the dress (as was initially assumed). This corresponded to the cut of the skirt which was a little lower and panelled to flare out on this side. 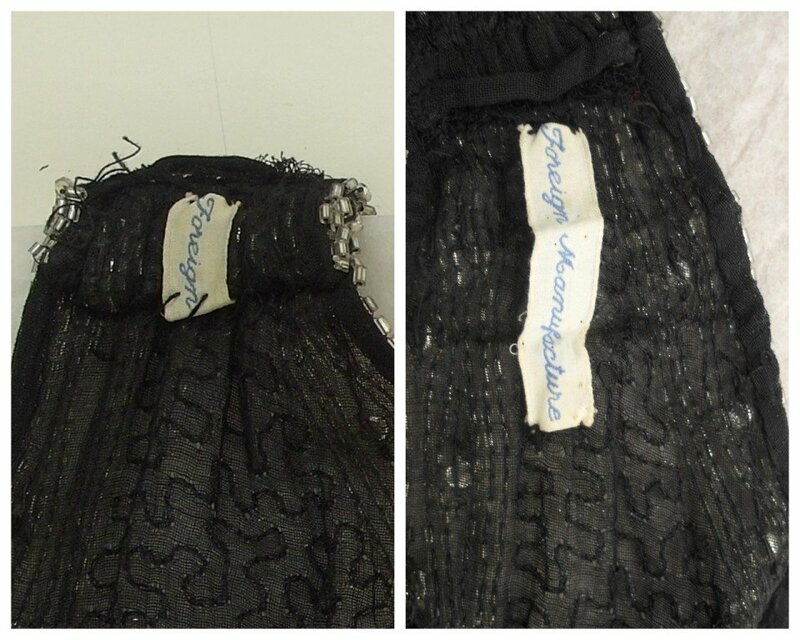 Removal of further later alterations revealed a ‘Foreign Manufacture’ label to the inside left shoulder. 1920s Paris was the fashion capital of the world and while this particular label remains a bit of an enigma, I have no doubt that it would have been most desirable to have a dress manufactured abroad. The condition of this particular example was quite remarkable as the finely woven cotton ground had proved robust enough to withstand the weight of the glass beadwork embellishment (contemporaneous silk examples tend to fare rather worse). The decision was made to replace the larger glass beads that were missing as these were integral to the flow of the design and a lengthy internet search ensued to find an authentic match. At the eleventh hour a bead dealer in Perth came to our rescue and provided the perfect infill. Beads and sequins were originally applied using a tambour work technique; a small hook is used to puncture the fabric and draw the thread through in a chain stitch catching a single bead or sequin each time. After much puzzlement and a little frustration I finally managed to replicate the technique with a needle and the next stage of the treatment will involve reinstating the loose sequins in this manner. Part of our conservation treatment is often to provide the client with realistic advice on future care. A short post on Jamie’s internship can be found here.